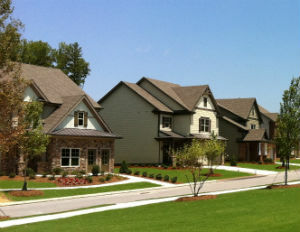 Village Center at Sterling on the Lake in Flowery Branch, Ga. Built by Stonecrest Homes, the community offers resort-style living with many amenities. Additionally, homebuyers can receive up to $11,400 in free options. Hurry in, these homes won’t last long! Buyers can choose from the Bradford, Coventry or Lancaster floor plans available for immediate move-in. The Bradford, normally priced at $186,363, has been reduced to $174,900. The home includes three bedrooms, two-and-a-half baths and 1,695 square feet of living space. Featuring a gourmet kitchen with granite countertops, tile backsplash and stainless steel appliances, the home is a chef’s dream. Additionally, hardwood flooring is found in the foyer, kitchen, powder room and dining room. The Coventry, now priced at $189,900, boasts 1,892 square feet of living space, three bedrooms and two-and-a-half baths. The master is even located on the main floor. Special features include hardwood floors, granite countertops, stainless steel appliances and beautiful tile floor in the master bath. Priced at just $194,900, the Lancaster has 1,900 square feet of living space, three bedrooms and two-and-a-half baths. The Lancaster features stainless steel appliances, hardwood floors, granite countertops and beautiful tile floor in the master bath. Buyers also have the option to build their own home starting from $154,900. The Abbott floor plan has three bedrooms, two-and-a-half baths and 1,575 square feet. This plan features his and her closets in the master, second floor laundry, large pantry and an open first floor. The Village Center is located within the lakeside master-planned community, Sterling on the Lake. The community offers amenities such as a clubhouse, fitness center, movie theatre, pools and much more. Conveniently located near Chateau Elan, The Mall of Georgia, the Gwinnett County Cultural Center and Lake Lanier Islands, the Village Center at Sterling on the Lake has something for every member of the family. Students residing in the community attend Spout Springs Elementary School, C.W. Davis Middle School and Flowery Branch High School. Students may also attend World Language Academy, Da Vinci Academy or K-12 Private schools.